Resulting from the collision of the Eurasian and Indian plates, the Qinghai-Tibetan Plateau is commonly known as the ‘roof of the world’. Collectively the Yarlung Tsangpo, Nu, Lancang, Yangtze, Yalong, and Yellow River basins drain the eastern margin of the plateau. In this paper, we utilize Shuttle Radar Topography Mission elevation data to examine morphometric and relief attributes of these basins to reveal insights into tectonic activity and rates of incision. 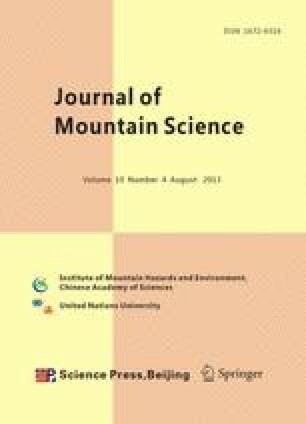 A robust technique using Matlab is proposed to alleviate errors associated with SRTM data in the derivation of river longitudinal profiles. Convex longitudinal profiles are interpreted to be a product of uplift rates that exceed rates of channel incision along the entire margin of the Qinghai-Tibetan Plateau. Highest relief towards the south reflects extensive fluvial incision. High relief is also prominent along major active faults. Erosion patterns are related to distance from knickpoints. Highest rates of erosion and incision are evident towards the south, with decreasing values towards the north, suggesting a link between tectonic activity and erosion.